He’s out there again--the coyote in the backyard of contemporary literature. Powell creates characters and tales that strike you as so real, yet surreal, and are rendered in language that somehow is stark but also stunningly intricate and profound. His original and wildly comic existential prose shows that Donald Barthelme and Barry Hannah are his closest literary kin--a rare pack to run with. 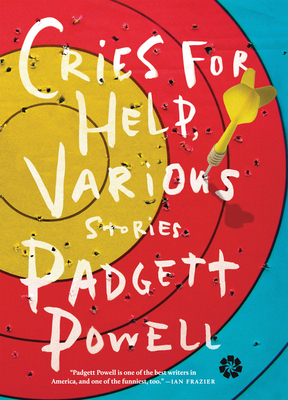 From the highly acclaimed author of Edisto and The Interrogative Mood, Padgett Powell's new collection of stories, Cries for Help, Various, follows his mentor Donald Barthelme's advice that "wacky mode" must "break their hearts." The surrealistic and comical terrain of most of the forty-four stories here is grounded by a real preoccupation with longing, fear, work, loneliness, and cultural nostalgia. These universal concerns are given exhilarating life by way of Powell's "wit, his . . . dazzling turns of phrase" (Scott Spencer). Padgett Powell's language is both lofty and low-down, his tone cranky and heartfelt, exuberant and inconsolable. His characters rebel against convention and ambition, hoping to maintain their very sanity by doing so. Even the most hilarious or fantastical stories in Cries for Help, Various ring gloriously, poignantly, true. Padgett Powell is the author of six novels, including The Interrogative Mood and Edisto, which was a finalist for the National Book Award, and two collections of stories. His writing has appeared in The New Yorker, Harper's, and The Paris Review, as well as in The Best American Short Stories and The Best American Sports Writing. He has received a Whiting Writers' Award, the Rome Fellowship in Literature from the American Academy of Arts and Letters, and the James Tait Black Memorial Prize. Powell lives in Gainesville, FL, where he co-directs and teaches at the MFA@FLA, the writing program of the University of Florida.